The city of Luxembourg is the capital of the Grand Duchy of Luxembourg and is located at the meeting of the Alzette and Pétrusse Rivers in southern Luxembourg. 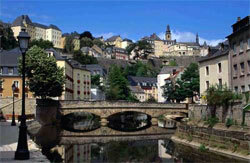 The city contains the historic Luxembourg Castle, established by the Franks in the Early Middle Ages. Luxembourg is a highly developed banking, technology and administrative centre and is a seat of several institutions of the European Union.